Google AdWords is an advertising platform where businesses can advertise on Google and its advertising network. The platform is widely adopted with over one million advertisers. Google’s 2015 revenue was $74.5 billion with $67.3 billion coming from ad revenue. That means ad revenue is accounting for 90% of Google’s overall revenue. Google’s search engine and advertising platform exploded with popularity. In the year 2000, they handled around two million searches per day. Now, they process over three billion searches per day. Just so you know exactly what I am talking about, below is a screenshot of the search query “San Diego Lawyer” and the ads displayed on Google. The advertisements you see below are referred to as pay-per-click ads or PPC ads. You will typically see up to 4 on the top of Google and up to 3 at the bottom. They also have a little box that says “AD” to distinguish between PPC and an Organic Search Result. If you’re wondering whether or not you should advertise on AdWords, the answer is probably yes. AdWords is incredibly important to small business. I have taken the time to write 20,000 words broken out into 7 postings on how to use AdWords profitably. Keep your eye out over the upcoming weeks for the reaming 6 postings. Read every word and you will be on on your way to mastering AdWords. PPC only requires advertisers to pay when someone actually clicks their ad. This concept is attractive because it’s a form of intent-based marketing where the user is potentially searching for the exact product or service you provide. The pay-as-you-go model in conjunction with the ability to track return on investment (ROI) is very appealing to ambitious marketers. If you have your account configured correctly, AdWords can be a huge revenue source for your business. I have seen countless advertisers set up an account, create a list of keywords, let Google determine the bids, and just dive right into advertising with AdWords. Let me tell you, this approach will inevitably end in a failed campaign. Not only does a campaign on AdWords need to be configured with care, there are also a number of steps that have to be checked off the list before getting started. Let’s go through them one by one. A pay-per-click campaign is going to attract prospects that are potentially at the end of the sales cycle and ready to buy. If you have a service business, make sure you have someone who is qualified to take inbound calls. I worked at a large agency for a number of years, and we recorded all of the calls that clients received from PPC. You would be surprised how many small businesses do not answer their phone when someone calls, do not handle the call correctly, or the person answering has absolutely no sales training. 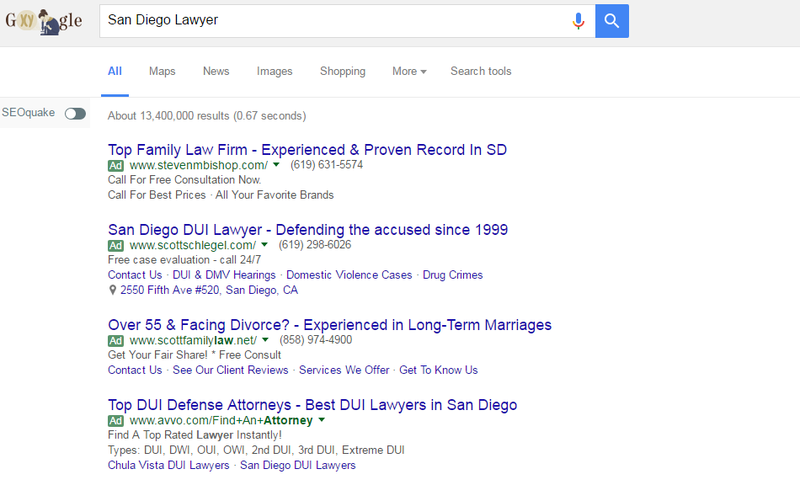 Imagine a law firm in San Diego running a PPC campaign. The cost-per-click on certain keywords can easily be $50 or more. Now, can you imagine if they are not answering the phone? Or if the prospect does not have a good experience with the individual who answered? They will surely call another firm and the initial advertiser will waste a colossal amount of money. Make sure you prepare your business for your new advertising campaign. Dedicate yourself or a reliable, polite, friendly employee with some sales experience to answer the phone. Cherish every inbound lead and position your PPC campaign to have the biggest ROI possible. If you are going to send paid traffic to your site, you want to make sure it offers visitors a good experience. Does your website clearly represent your products and services? Is the contact information in a place that is prevalent and easy for the user to find? Are your services categorized by different pages so you have specified landing pages for your ad groups in AdWords? It’s worth being thorough and making sure your site is set up to convert traffic prior to launching a campaign. Is PPC working for your competitors? Why not spend the time to do a little reconnaissance. If your competition is doing well in regards to the keywords they target, it can help you build a successful campaign. There are a number of tools you can use to spy on your competition. Once of my favorites is SpyFu. SpyFu allows you to download your competitors’ organic keywords, PPC keywords, along with their actual ad copy. It’s definitely helpful when you’re building out your keyword list or writing ad copy. Before you go any further, review your finances and allocate a budget exclusively for AdWords. Think about your budget as your monthly budget multiplied by the sum of how many months you are willing to test out the publisher and see if it will yield positive results. For example, if you are allocating $3,000 a month for six months, your total budget is $18,000. This type of mindset will commit you to the process and ensure that you don’t halt the initiative early on when things aren’t going as planned. A successful AdWords campaign will require dedication to the details, online research, potential improvements to your website, weekly campaign maintenance, and an ongoing review of a variety of different metrics. The best campaigns are managed by marketers who understand that the campaign will require time, energy, an analytical mind, and the willingness to continue to learn in an effort to constantly improve results. You will need to make some important decisions upfront around the marketing objectives for the campaign. Once your marketing goals are clear, you will find it much easier to determine which settings to select inside of AdWords. You will want to create one campaign for each specific marketing goal or each product/service type. For example, if you have a law firm that does criminal law and family law, you will need to create two different campaigns for each type of law. I own a San Diego PPC company and would love to help you launch and manage a Pay Per Click Campaign. Check out my PPC Services and call me today for your no obligation quote. Email brian@rocketpilots.com or call me today at 858-775-4110 or request your no commitment consultation. Are you currently running an AdWords campaign? Leave a comment and let us know your experience with the platform.